Remember our game that E and I like to play when we travel? 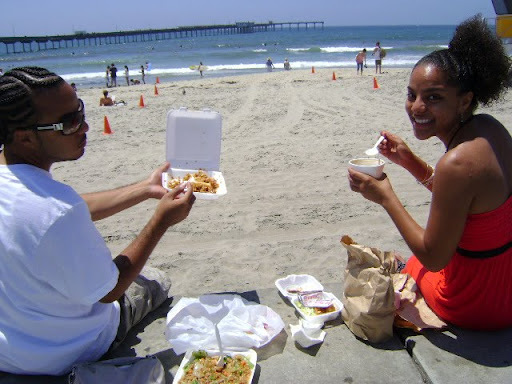 We were having a quick lunch on the beach - - yummy chinese food. Shortly after E finishes his food and tosses the empty container in the trash. Immediately this random guy jumps into the trash and opens E's discarded dish only to be disappointed to learn that it was empty. 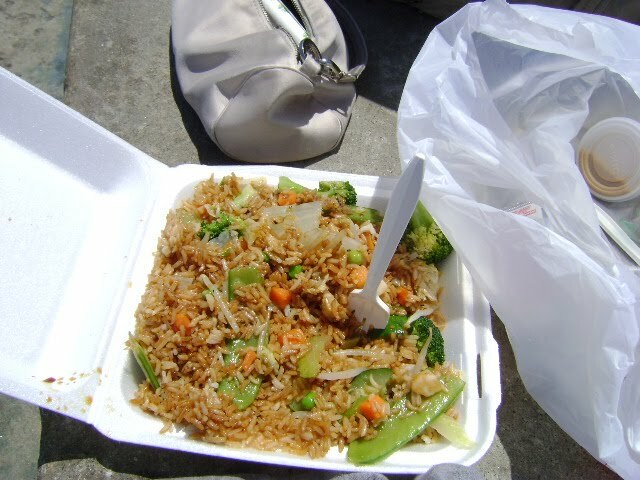 I felt bad and gave him the the remaining fried rice. Only for a half of a second did I hesitate because I really, really wanted to eat the rice for later. I concluded he needed my container of food more than I did. Hank ran across the street, quickly gobbing the lunch. I soon discover that he is sharing his food with a friend, whom I've named Gnarly. At that point, E's sister felt bad and decided to give away her remaining lunch to the fellas. E gladly walks across the street to give them the extra bag of food. Not before I snapped a picture. Hank is the guy in the red shirt and Gnarly is the guy in the orange.